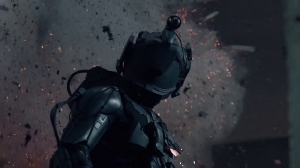 Neill Blomkamp's Oats Studios have launched a trailer for their latest short called LIMA, a longer format short exploring the ideas of multinational corporations, secret government programs and failed scientific experiments. When I spoke with actor Kellan Lutz a couple weeks back, the actor told me the short was one of the best yet and that he was thrilled to be a part of it. The director of District 9 and Elysium started Oats Studios and partnered with Steam to release his experimental sci-fi shorts. Previous shorts include Rakka, Zygote and Firebase.